Cinelicious Pics has debuted an official trailer for a super low budget indie drama titled Dark Night, from New York-based director Tim Sutton. The film premiered at last year's Sundance Film Festival in the low budget Next category, and is opening in limited theaters this February. It follows a troubled kid planning a mass shooting, loosely based around The Dark Knight Rises shooting a few years ago, even though it's not the same story (turned into a film). Starring Robert Jumper, Anna Rose Hopkins, Karina Macias. I saw this film at Sundance last year and it's definitely not for me: oh so boring, not much of a plot, really not impressive in any way. Of course, that's just my opinion, other critics found more to appreciate. Have a look. A haunting, artfully understated critique of American gun culture, Tim Sutton's third feature is loosely based around the 2012 massacre in Aurora, Colorado that took place during a multiplex screening of The Dark Knight Rises. 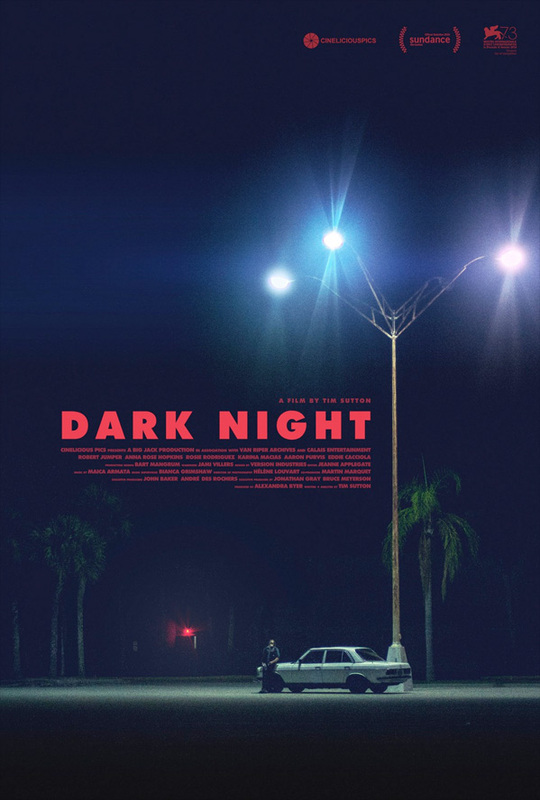 Employing a mesmerizing documentary-style technique and a cast of non-professional actors, Dark Night follows the activities of six strangers over the course of one day, from sunrise to midnight, the shooter among them. Dark Night is both written and directed by American filmmaker Tim Sutton, of the films Memphis and Pavilion previously. This premiered at the 2016 Sundance Film Festival last year. Cinelicious Pics will release Dark Night in select US theaters starting February 3rd this winter. Is this not exactly Elephant by Gus Van Sant? I would think Elephant is closer to The Dirties than this movie. Elephant the characters were motivated by being bullied, not mental illness. The Aurora shooting was carried out by a mentally ill man. I hope the movie attempts to bring awareness to mental illness. Just a century ago, mentally disturbed people used to be locked up in padded rooms. Their families disowned them, and they barely had more rights than animals, and mental institution could do anything they wanted to them. Now these same people walk the streats untreated and armed with all the weapons they can carry. They are the subjects of endless films, the heroes of reality TV, and the favorite fetish of social media. Why did sanity become so out of fashion? Respect to the labor department who worked on this film, but it should have not been made. Putting this kind of behavior on screen, maybe not glamorizing it in the traditional sense, but making it available, will just legitimize this behavior in the minds of unstable people.